Emotional Intelligence – a term quickly becoming more common in corporate America. Consequently, its growing popularity is peaking interest. But what exactly is emotional intelligence? Technically speaking, the Institute for Health and Human Potential defines this catchy term as “the ability to recognize, understand, and manage our own emotions while being able to recognize, understand, and influence the emotions of others.” We simply refer to it as, “the secret to creating success.” It’s incredible, and we are so excited about this emotional intelligence training! Why are we so excited? Because we have found the best of the best. 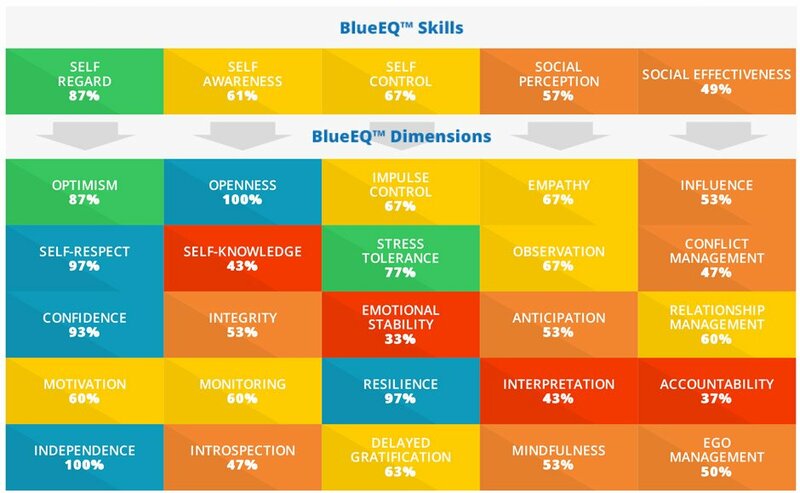 We have recently partnered with BlueEQ, the company behind the world’s most accurate, comprehensive, and powerful emotional intelligence self-assessment and workshop. They are the frontrunner in this emotional intelligence training initiative, and we are honored to be partnering with them. Together, we aim to bring a better understanding of exactly how impactful emotional intelligence (EQ) is to the marketplace. The feedback we have received thus far has been eager interest from so many. BlueEQ’s emotional intelligence self-assessment consists of 150 questions and takes 20 minutes to complete. Once the participant completes the assessment, the system generates a report on the state of emotional intelligence. The results appear in the form of a heat map to illustrate the results in chart form. Also included is a development guide that identifies priorities, development tools, and activities to encourage growth in overall emotional intelligence. The purpose of an EQ assessment is to bring to light the areas of improvement for a team while also presenting an avenue to achieve this improvement. Highlighting these areas in a personal assessment allows individuals to identify ways to improve and creates a sense of ownership and responsibility to meet these goals. Giving an entire team the assessment stimulates conversation, which, in turn, produces individual accountability and, more importantly, trust. When people realize they are not alone in their quest for personal improvement, they often become more open and feel safer discussing shortcomings and areas of concern. Words and actions influence. When negative, words and actions have the power to completely shut down creativity and progress. But, when used positively, they drive accomplishment. When addressed and put into practice, organizations and companies can build critical bridges for team success. We are so excited to be partnering with the company that offers unique solutions for meaningful, substantive success. With heightened awareness of personal impact, the workplace becomes a safer place to voice ideas. When fear of judgment is minimized, ideas flow freely. BlueEQ explains it like this: Consider what occurs when you have a team of people with high IQ. Yes, they are brilliant individually but not collectively. Often they believe their ideas are superior to others and find it hard to compromise. Emotional intelligence barriers get in the way- these teams are often unable to find middle ground. “These EQ barriers become team barriers, and team barriers become innovation barriers. A lack of emotional intelligence becomes the limiting factor, and no amount of IQ can make up for what the team lacks in EQ.” Thus, the BlueEQ solution builds a team’s ability to work together towards innovation, which ultimately leads to optimal success. BlueEQ’s core logic behind its emotional intelligence assessment is brilliant. They propose that enhancing emotional intelligence creates psychological safety. This, in turn, has career and business impact both for the individual and the company as a whole. It creates a learning environment in which people are no longer hiding individual areas of needed improvement behind pride and defensiveness. Team members are willing to work towards improvement because everyone around them is doing the same. The atmosphere shifts from competition to collaborative learning. It is truly remarkable. As a trusted adviser in the learning and development industry for thirty years, we, Synergistx, believe this emotional intelligence training has the ability to completely transform corporate America. We are incredibly pleased to work alongside BlueEQ bringing this transformational solution to today’s marketplace, resulting in sustainable change.